Quintessentially Eastern, with its glittering mosques, rich velvet nightspots and smart hotels, Istanbul is undeniably perfect as a glamorous incentive destination. Team it with a night spent discovering the absolute wonder of Cappadocia, with its Fairy Chimneys and breath-taking terrain and you begin to see a very different and utterly captivating land. 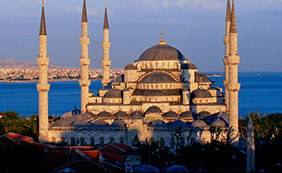 Istanbul itself sits proudly on the Bosphorus River spanning the continents of Europe and Asia. Like London, New York or Paris, it is one of the world’s great cities. Vibrant, with a population of 15 million and a booming stock exchange it effortlessly combines contemporary style, history and sheer romance. 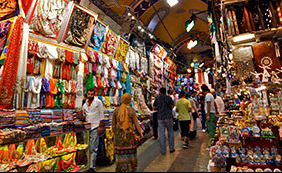 Walk through the cobbled streets of Old Quarter, with it’s dramatic skyline of domes and minarets dominated by Hagia Sophia, haggle for a sumptuous Turkish carpet in a centuries-old bazaar or spend the day lazing aboard a private yacht and the evening in the lively entertainment quarter of Beyoglu. Istanbul is a city where the clichés are for once accurate and East genuinely does meet West. In contrast, Cappadocia is a truly mesmerising destination. Where else can you float over the Fairy Chimneys in a hot-air balloon in the morning, admire Byzantine frescoes in the afternoon and sample fine food and wine at night? Guests can choose between indulging in a frenzy of shopping at the Ottoman bazaar or enjoy quad biking across the unique lunar landscape. In the evening watch dervishes whirl against a spectacular backdrop whilst sampling the superb restaurants and wine cellars of the Cappadocia Cave Resort where the award winning cuisine. there is so much more to Turkey than meets the eye.